The best way to learn how to use heart energy is to know that the Universe is in all things and that there is nothing that is outside of the joyous peacefulness that is surrounded by and filled with the Universe. Once you know that all things are a part of all things…that all things are at once one and a part of the Universe and a part of all beings and all things within and outside of the Universe, this loving peacefulness can begin to become a part of you. Heart energy may not be easy for you to bring into your body. However, if you begin to open the doors just a very little bit…allow a little of the light to seep in…to not be so negative all the time…to not look for all the bad things that are happening…but to disregard that and to move onto things that are good, then you are seeing and feeling the beginnings of heart energy. Looking at a bird flying through the tree is as important as looking at the picture of an auto accident. It is important to come away from those things that bring heartache and sorrow and to move to things that bring joy and passion. The more that joy and passion are brought into your life, such as a joy and passion for another person or even for a piece of wood, then that will bring the joy and passion into your heart. Opening yourself to these things will allow more of them to come in and create heart energy that will then begin to flow outside of your body. Once the heart energy has moved into a bigger sphere around you, then you begin to move closer and closer to the Universe. 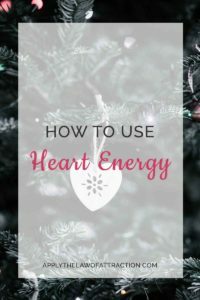 How long does it take to learn how to use heart energy? To learn how to use heart energy, it is but a single, singular, very minute moment in the time of the cosmos; an instant; so quickly done. However, as the time on planet Earth, your lifetime, stretches out much, much longer, it may seem to you that it takes quite some time for heart energy to expand and touch others, and to become a glow around your body, but it must be begun. Because if it is not begun, then your heart energy can never expand, can never grow and can never touch others. So beginning to learn to use heart energy is of the utmost importance. Not begun is not begun. Once begun is only the first of opening your heart energy up to flowing out and being much more than what it is. Although it may seem to you that it takes a very long time to first open your heart energy, it is actually very short if you would only just begin. The more that you can trust your ability to do this, it will become such that automatically you can send and provide this energy and this information out to others. When you allow yourself to attempt to do this many times during the day, you will see that generating heart energy will be easier and easier to do. Now your heart appears and feels very flat, very one-dimensional. What needs to happen is your heart must grow and expand becoming fatter. It’s not the same as your physician speaking to you about cholesterol and other types of dis-eases that occur to cause the tissues in your body to become bloated or ill. But that your heart blows up, it expands, becomes lighter, softer, stronger with the filled-up heart energy that you have the ability to have inside of you. The more that you can fill-up your heart with love for all, for yourself especially, the more you can then take what is filled inside of there and know that it will never decrease, but be always filled. You can send out this same feeling to others and they will feel it and send it back to you. You will find like-minded people who will see your heart energy, accept it, and return heart energy to you. Can You Use Heart Energy to Manifest a Relationship? I’m in love with a girl (I call her ANGEL!) and our love is very very very strong; I mean I feel the love every second in my life. It’s very good and mind blowing (People who has this experience know what am I saying!). With this love, do you think my heart is open enough to use heart energy? You said these works to open our heart. I mean, with this amazing love (That I have), is my heart open or I have to do these to open it too? Heart energy isn’t the same thing as being in love with someone. You might want to try working with the energy, sending it to her and to others…learn how to use it. Do you mean when we want to use the Heart Energy to attract something, We have to send the Love filled our heart (Heart Energy) to that thing and feel we are one? For example the car and me are one! been betrayed or hurt over and over again. I find it hard to be nicer to people or trust somebody easily. My mind energy constantly stops me. Thanks! Openning yourself up to people doesn’t mean trusting thim to the absolute limit. It means being yourself and being optimistic no matter how life and people take you down. A lot of people have been through those situations of betraying and stuff, but when you allow yourself to forgive and forget and re-live again, It will really increase your happiness and acceptance to yourself and you will be full of power and energy because you will feel you’re a good person. Simply, you will feel the bright halo around you.